Without a doubt, one of the most popular activities for guests cruising through the Caribbean is scuba diving. And, this is not surprising considering the exciting array of things to discover below the water’s surface here. In addition to a huge abundance of sea life including hundreds of species of fish and even the occasional shark, the sea floor is also littered with treasure like natural corals and sponges and even a ship wreck here or there. The island of Roatan, found just north of Honduras mainland, is an excellent place to explore the watery world below, and there are many Roatan tours to help cruise ship guests do just that. For the less adventurous or those who are aboard their Western Caribbean cruises with children, there are many snorkeling options available on Roatan. These adventures take advantage of the abundant shallow, clear waters found on Roatan and allow visitors an opportunity to experience some of the sights found below the surface of the water. Regardless of whether your watery adventure on the island sticks to the surface or dives down below, there are numerous Roatan tours to choose from. The area is almost exclusively tailored to tourism, meaning that there is no shortage of Roatan excursions to be booked. 1. Shipwrecks and Sun: One of the absolute best underwater Roatan Tours is the Shipwreck Snorkeling and Beach Break encounter. Here guests can snorkel around the island’s system of mangroves and along the diverse ecosystem found along the reef. 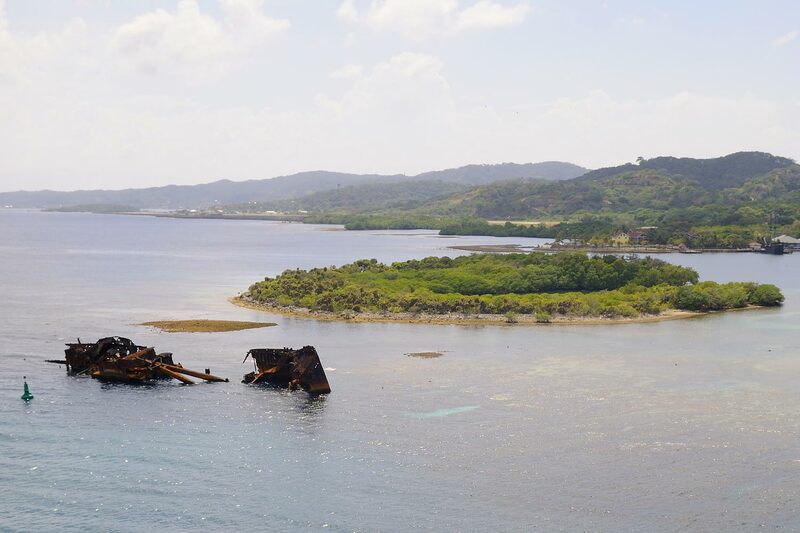 The climax of the journey however takes guests to view a freight ship that is more than a century old that has been taken over by the corals and plants that grow here, a truly mesmerizing sight that is not to be missed. This adventure also includes some time on the surface, where guests can soak up the sun on the beach before and after they get wet. 2. Up and Down Again: The Canopy Zip Line and Reef Snorkeling Adventure provides guests aboard a cruise to Roatan a one stop shop to see everything that the island has to offer both above and below. Combining two of the most popular Roatan tours available to guests, snorkeling and zip lining, visitors start out with a high adrenaline coast through the canopy, varying between two and three stories off the ground. After a snack stop and soaking up some sun, guests are then boated to the Blue channel to encounter schooling fish and the intricate reef system that the island is known for. 3. Boats and Below: The Private Catamaran Sail and Snorkel Tour allows private groups of guests up to fifty a way to experience both the coastline of Roatan and the waters below. Catamaran tours give visitors access to new and exciting snorkel sites that are not accessible beach side that give way to one hundred foot sea visibility and an opportunity to catch a view of local residents like parrot fish and brightly hued squids. These Roatan tours are often more intimate than the tourist filled excursions booked ashore and are worth considering for anyone looking for a unique way to view the island from above and below. 4. Dive Deep: Hands down, Roatan Discover Scuba Diving is the most popular scuba adventure the island has to offer, and it is no surprise that it is one of guests’ favorite things to do in Roatan. One of the reasons why scuba diving is so popular in Roatan is that it is an ideal environment for beginners and those new to scuba, because many of the most incredible sights below are still relatively close to the surface, meaning that divers are not obligated to reach great depths to encounter the amazing underwater world around them. An hour long training session gives way to one of two sea based Roatan tours where guests can either launch from a boat or the shore depending on preference and experience level, but both tours provide an equally awe inspiring view of the vibrant corals and fish below. Because of the incredible diversity of life and natural features found just below the surface of the water, it is not surprising that many Roatan tours offer guests opportunities to get wet. There is a wide variety of options sure to please every visitor whether they want to start their encounter with a high adrenaline activity or a calming boat ride. Western Caribbean cruises to this part of the region should almost certainly include one of many excellent watery Roatan tours.